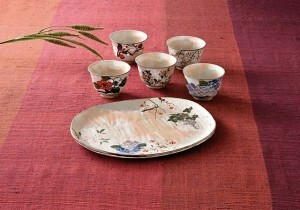 This is a Japanese SHIMIZU-yaki (KYO-yaki) plate and cups set. Kyo ware is made in Higashiyama area in Kyoto. It started about 1590’s, developed with the popularity of tea ceremony. Formerly, Kyoto was the imperial capital of Japan; therefore, first-class artists and craftsmen worked there and inspired each other. That is why, Kyo ware is elegant and has the traditional taste of the court. Most of them are over enameled after sintering. Because each famous Kyo ware artist had strong characteristic, there are varieties of designs in Kyo ware. One of the famous artists who stylized Kyo ware is, Nonomura Ninsei, who created the soft colored enamels for Kyo ware.